The days have grown short, the air is crisp and cold, Christmas season is certainly in the air. The only thing making these dark winter days brighter are Christmas markets lighting up across cities everywhere (in Europe, anyways). We decided to a little research for you, on the best hidden gems from experienced travelers! We know all about the gliterry Striezelmarkt in Dresden, the stunning Viennese Dream Christmas Market (Wiener Weihnachts Traum) in front of its majestic City Hall and, of course, the traditional Old Town Square Market found right here in Prague. Thanks to all the travellers whose insights and trusted experience is quoted in this article. “Six Christmas Markets in the historic town. Each of Colmar's six Christmas Markets is a separate mini-village with its own collection of passionate craftsmen. Installed in squares with their own architectural signature, these islands of festivity reflect the character of the city hosting them: friendly and authentic. For six weeks, the whole of Old Colmar, miraculously protected from the vicissitudes of history, becomes one huge multi-faceted Christmas Market. Here, as you browse round the 180 stalls, you really feel the magic of Christmas seeping into you. It's all about experiencing the wonder of a child again; it's not something you can control, you just have to feel it. “As soon as I set my feet there, they made me fall in love... The atmosphere around their narrow streets filled up with "gingerbread houses" was unique. Idyllic towns [taken] out of a story!!! Trier, Germany” Now in its 39th year, the Trier Christmas Market is once again one of the loveliest in all of Germany. Beginning Friday, November 23, about 90 attractively decorated booths will be open until December 22. Set on the medieval Main Market and in front of the imposing backdrop of Trier Cathedral, the market is admired by visitors the world over. We tend to think of Croatia as a summer destination for beach adventures! Well, it’s so much more than that. Save the best for December and don't wait for Santa sitting by your fireplace, find him in the city! Make sure you polish your boots before you go because Zagreb has in store for you a number of holiday surprises, including the musical program which will make you want to dance all night long! We might be a little biased, but we think Prague come winter is some other kind of magic. The city, once blanketed in a layer of snow, becomes an entirely different beast that seems almost too good to be true. Prague and winter go together like schnitzel and potato salad. We can only hope our Manifesto Winter Market can provide that same feeling of magic and wonder, you know what kind we are talking about, the kind you experienced as a kid. While we can't wait to create a special experience and welcome you to our own, and very first Manifesto Winter Market near the Prague's city center, we also dream of that Christmas cheer throughout all the Christmas markets across Europe. Check out some of our favorite hidden gems below (and tag us if you have the chance to post a live picture from any of them!). “Welcome to M.O.N.T.R.E.U.X Christmas Market! Many chalets along the lake, with a selection of gifts, vin chaud & food! “In its 24th edition this year, Montreux Noël offers entertainment for all ages with its traditional Christmas Market, which stretches along Montreux's lakeside promenade, which is specially lit and decorated for the occasion. “Looking down over the Innsbruck Christmas Market and its huge tree. In the background you may notice a golden roof, this is the Goldenes Dachl. It is considered to be the city's most famous symbol, the roof was decorated with 2,738 fire-gilded copper tiles and was completed in the year 1500. ” The 70 market stalls are nestled between attractive medieval buildings and the Golden Roof and they offer Christmas tree decorations, handicrafts, woollen goods and souvenirs. A viewing platform offers wonderful views over the roofs of the stalls. For a promenade into a fairy tale lane, take take a wander down Kiebachgasse, the street that runs parallel to Erzherzog-Friedrich-Straße: numerous characters from famous fairy tales can be seen on the buildings’ façades, bay windows and gables. Halley is an American expat and foodie living in Prague. 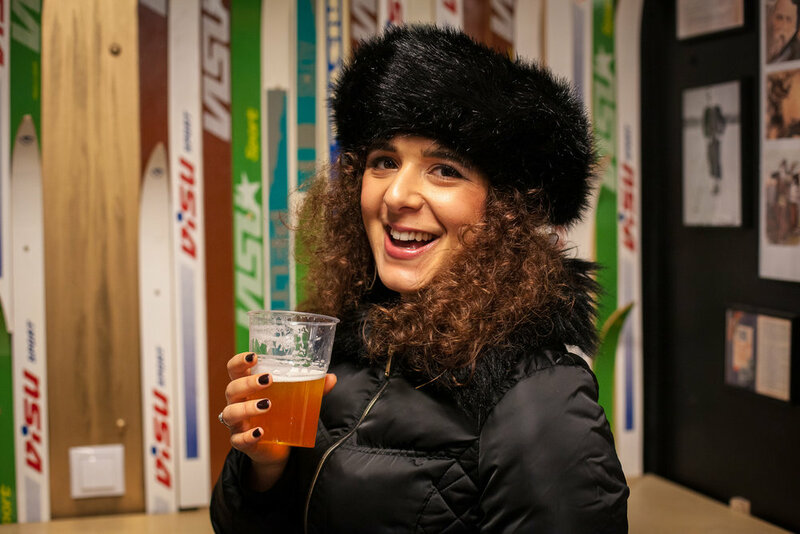 Her favorite activities during the holiday season include hosting potlucks with friends and drinking svařák at Prague’s Christmas Markets. Follow her delicious journey @imajorineating.